Do I owe it to anybody to lose weight? 1. What about your children? Don’t you want to be around to see them grow up, get married, have children of their own, and retire? First of all, let me remind you that you won’t be there to care for your children if you spend the rest of your life in prison. So, put down the butter knife and back away slowly. Seriously, this is like DEFCON 5 in the guilt wars over your body, so I can see how it might make you very upset to hear this, but let’s talk it through, okay? First of all, please remember that weight and health are not the same thing. Most people only have a limited amount of control over how much they weigh. And while there are some things we can do to help increase our odds of having a healthy life, none of us knows how many days we have left on this earth. One of the things that you can do to increase your odds for a long, healthy life is to manage stress. So as much as you want to strangle Aunt Thelma for asking this question over the holiday ham, please remember to take a moment and just breathe. Some other things you may be able to do to increase your odds are to exercise regularly, sleep well, eat a wide variety of healthy foods (especially fruits and vegetables), and engage in some regular activity to help manage stress. Note I said that these are things you may be able to do. Obviously, if you’re working two full-time jobs and taking care of a few children, stuff like stress management classes, regular exercise, or getting any sleep may not be possible for you right now. Not everybody has access to the same opportunities for healthy stuff (more on that in a minute). And maybe if Aunt Thelma is so concerned about your health, maybe she can babysit your little darlings three times per week while you take an exercise class, meditate, or just have fifteen minutes to go to the bathroom all by yourself. 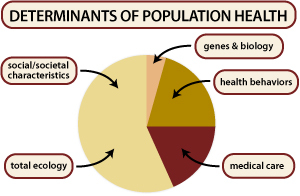 As you can see, health behaviors only account for a relatively small section of the overall determinants regarding whether or not a person is healthy. And notice it says health behaviors. To be very, very clear here, body weight is not a behavior. You cannot tell how healthy somebody is or whether or not they engage in healthy behaviors by looking at them. 3. I don’t like having to look at you because your fat body hurts my delicate aesthetic sensibilities. Most of the time, the answer to this statement is simple. Just. Don’t. Look. If your Dad’s friend Jim finds it uncomfortable to look at your fabulously fleshy frame, he can just look the heck away. You are under no obligation whatsoever to be attractive to anybody’s gaze or be considered as an object of lust. This situation is far less simple however, when you are talking about your spouse or your kids. I am unbelievably privileged to have a husband who thinks my fat body absolutely rocks his stripy socks. But I understand that not all women (or men) have a spouse that thinks this way. I have seen marriages get hopelessly tangled around one spouse helping another to lose weight “for their health” all the while not discussing the real issues around body size and sexual attraction. I have seen kids use weight as a tool to hurt their parents (and vice versa). I have seen kids who ask that the “thin parent” be the one to appear at school functions and do public things with the child in order to “escape embarrassment”. First, let me say that if this is happening to you, I’m sorry. You absolutely do not deserve this, and my heart hurts for you. Second, let me tell you that this situation is far beyond what I can cover in my humble little blog. There are no funny or glib comments that I can make here that will make this problem just go away. Let me suggest that you do whatever is in your power to find help. Maybe you can get some family counseling. A lot of counseling is available on a sliding fee scale based on your income. Perhaps a clergy person can help. If your family is not willing to go to counseling with you, maybe you can at least find some counseling for just yourself. And let me also offer some hope here. I have known people in this situation that were able to find help. And I have known marriages and families that have come through this with relationships intact and stronger than ever. Find some help, and hang in there. Summary There is so much more I could say about this topic. In terms of my own health practice, I’d really like to get a little bit more sleep. So let me wrap this thing up. Regardless of what you decide to say to your Cousin Tony and your Aunt Thelma, please remember this: you do not owe it to anybody to lose weight. You don’t owe it to yourself, and you certainly don’t owe it to anybody else. Your body is your business. If Aunt Thelma and Cousin Tony are actually concerned about the state of your life and the state of your health, I’ve already suggested some things you can request. They can pay for your meditation classes or do a little free child care (as long as they aren’t expecting weight loss, or any other specific outcome in return). However if Tony and Thelma are just trying to pass a little holiday guilt and judgement along with the gravy boat, they can just step the heck off. Here’s wishing you a holiday that is peaceful–or at least calm enough to avoid homicide. P.S. Looking for a little help? How about joining my personal training program? Prices are going to go up in January, so why not lock into some holiday savings right now? This entry was posted in Uncategorized and tagged CDC, family, family worried about fat people and health, fat and ugly, fat people living to see their children grow up, fat people raising health insurance rates, getting my family off my back about weight, getting through the holidays, health and SES, Health At Every Size, health insurance, heath and socioeconomic status, holidays, my body is none of your business, my body my business, my family wants me to lose weight, shame, size acceptance, social determinants of health on December 10, 2013 by fatchicksings.